Have an amazing adventure high in a natural forest as you reconnect with each other. 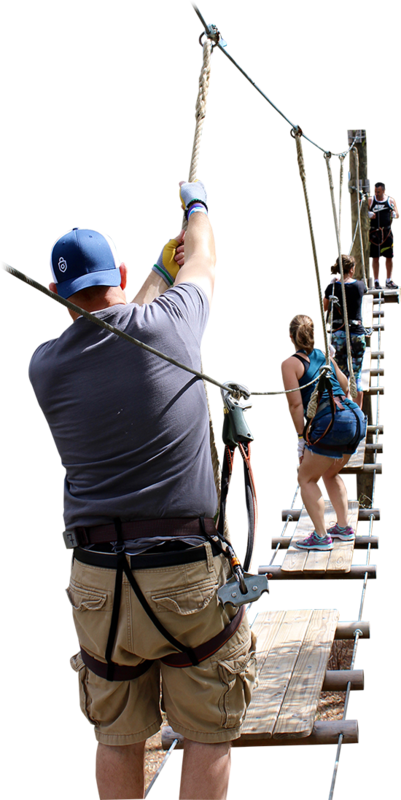 Your group will be climbing through a real pine forest, leaping into nets, crossing wobbly suspended bridges, navigating swinging logs, balancing on skate boards and soaring to an awesome finish on giant zip lines. Our 4 adult courses provide obstacles for all levels of adventurers from families to thrill seekers. 10 or more? We’ve got generous savings on group rates as well as special group packages to make your experience even more thrilling. Whether you want a day of exhilaration or team building, you’ll get your plans off the ground at Tree Trek. Come on out and have a blast or we can design programs to meet your group’s goals and objectives. Go wild on your next family reunion. Reconnect with your loved ones amidst 7 acres of natural forest. Race each other on twin Giant Zip Lines. Snap photos at our Picture Stations. Our challenging workout is the most fun you can have staying fit. We welcome cycling, hiking, kayaking, martial arts, boxing, yoga, fitness groups and more. Make us a part of your fitness routine at special rates. Develop high performance leaders and teams. Our programs are designed to teach goal setting/achievement, trust, cooperation, overcoming fears and leadership skills. Our professional instructors create organizational change through programs customized for your group. Amazing Birthday Parties Happen In The Trees.